In the spring of 1942, W.J. (Webb) Stewart hooked his homemade two wheel trailer to the back of his Chevy Coup and traveled to Ames, Iowa to the bred sow sale of Sunset Knoll Farms. Accompanying him was his wife Agnes and 2 year old son David. Coming home with them was their first Duroc sow Lassy Sunset. Each of the next several years, a bred sow was purchased on order by the Duroc Swine Registry field staff. 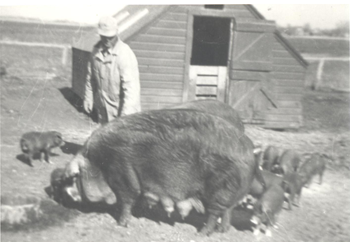 David recalls the excitement of going to the Burt, Iowa train depot to pick up these sows which had been shipped to them by rail in home-made wooden crates. Thus began the long association with the Stewart family and the Duroc breed. David Stewart started his own purebred herd in Waverly, Iowa with sows from his father and built the herd into a nationally and worldly recognized leading Duroc herd. Stewart Durocs won many state and national shows and dominated the swine performance testing stations which were used heavily in the 1970’s, 80s and 90s to evaluate pig performance. Demand for their genetics was world-wide as pigs were exported to swine producers in many countries. In 1984 son Doug graduated from college and joined the operation and in 1988 Carl Stein joined in partnership and started Stein and Stewart Genetics in Odessa, Missouri. Many things have changed in the swine industry over the years. Today Stewart’s Duroc Farm and Stein and Stewart Genetics are separate farms but still work in cooperation in genetics and advertising. Durocs,Yorkshires, Hampshires and crossbreds are produced at both operations. While high performance genetics are still sold to American commercial producers and exported throughout the world a major emphasis is put on showpig production for the large and growing youth show industry. We are very proud of our history in the purebred swine industry and look forward to our future working with you producing the champions of tomorrow.